The REDD+ project activities are to be implemented in the project area with Ecological Restoration Concession (ERC), most of which is covered with natural forest. Activities for forest conservation, protecting endangered orangutan as a safeguard will be conducted. In forest areas surrounding the ERC area, many concessions for commercial logging have been sold. Therefore, risks for deforestation have been increased in the ERC area. By using IT devices (eg. NEC LifeTouch), forest & ecosystem management activities are to be supported in the project. 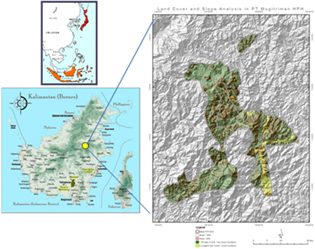 The project area (ERC area) is about 86,000 ha, located in the East Kalimantan Province. 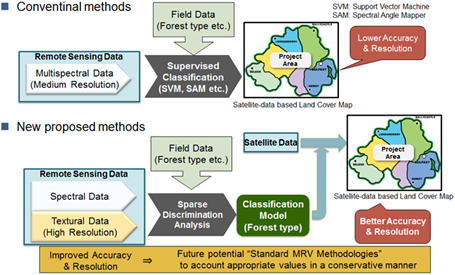 In general, satellite multi-spectrum data are applied for land classification analysis. In this FS, by applying high-resolution textural data, sparse discrimination analyses are conducted so that the accuracy of land classification can be improved.